Our 3 amazing corn snakes live in (securely locked!) vivariums near the Heroes Year 3 middle room. Lots of people are nervous or scared of snakes but corn snakes are completely harmless! In fact, they are very gentle and make fantastic pets! Our adult corn snake is called Kellogg. He is nearly 5 years old. Kellogg measures around 160cm long - he is adult size and is unlikely to grow much more. On the wall above the snake tanks, there is a display of Kellogg's shed skins. 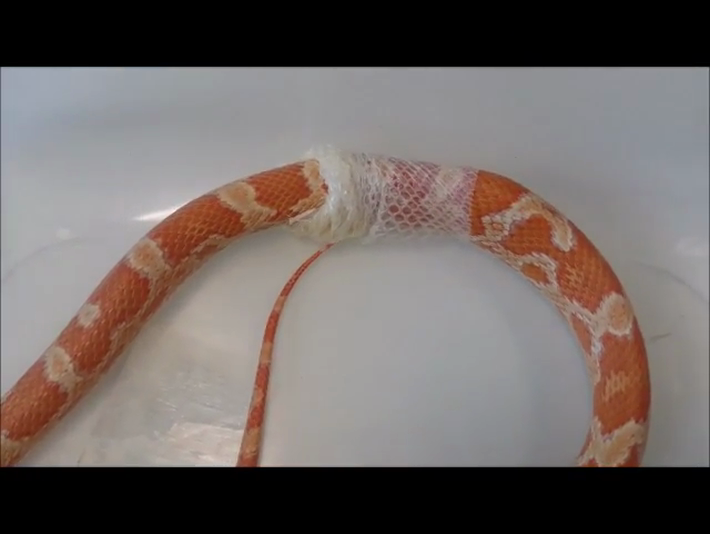 When snakes grow, they peel off their old skin like a sock! Most of the time, the shed skin stays in one piece and it is always interesting to measure the length to see how long it is. However, measuring the skin to find Kellogg's length is not very accurate because his skin stretches as he wriggles out of it! Still, it does give us a rough idea of how long he is! Kellogg will shed his skin every 4-5 weeks. Around a week before he sheds, Kellogg turns 'blue'. This just means his normally bright, glossy skin and eyes becomes dull and milky. During this time, Kellogg is a bit sensitive to being touched - but who can blame him? It must be uncomfortable having your skin peel off! Notice how milky his skin looks? Kellogg eats once a week! He always has clean water in his tank to drink but snakes do not need food as often as we do! 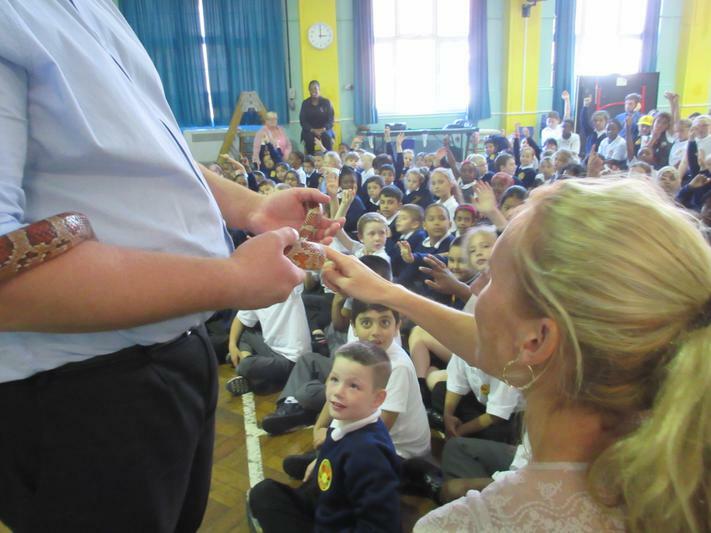 KS2 Science Academy children had a lesson about animals and humans and were lucky to watch Kellogg being fed! Snakes swallow their food whole! Snakes have lots of teeth but use them for gripping their food not for chewing. Mmmm... slurp! It's a bit like spaghetti! A few minutes after swallowing his dinner, you can see a small bump down his body, but it soon disappears! Snakes are incredible eaters! Can you see where the mouse is now? Snakes smell with their tongues! Have you noticed that they have forked tongues? This helps them when they are hunting for their prey. Corn snakes do not have brilliant eyesight but they have an amazing sense of smell. When they flick their tongues into the air they are collecting smells. If a snake is hunting for dinner and smells the mouse on the left side of its tongue, it will move to the left. If it smells mouse on the right side of its tongue, it will move to the right and when it smells mouse equally on both sides of the tongue, it knows to move forward! How clever! Our baby snakes were hatched in October 2014, so are now 8 months old. They live in a smaller tank next to Kellogg. The baby snakes are called Curly and Popcorn. Popcorn is more of an orange colour, whilst Curly is red. Popcorn and Curly are around the same length. They have different personalities! Popcorn is always curious about new things. He will investigate anything new in his tank and loves to slither around keeping an eye on things! Curly is more shy. He spends most of the time burrowed underground, hiding. Occasionally he will pop up to see what's going on but he tends to leave the nosiness to Popcorn! Can you see anyone peeping out from under the cave? It's only Popcorn being nosy! Popcorn and Curly are fed 2 'pinkies' once a week. 'Pinkies' are one day old mice and are just the right size for small snakes like these two. Curly is always a good feeder! He will strike at the mouse as soon as it is offered then gobble it down quickly! Curly and Popcorn enjoy watching us, almost as much as we enjoy watching them! March 2016 - Spring Term! All the snakes have been really active for the past few weeks. Usually, they can be found curled up asleep in their box or under the rock. However recently, all three have definitely been on the move! Must be the spring weather! Kellogg has been trying to visit his neighbours Curly and Popcorn! 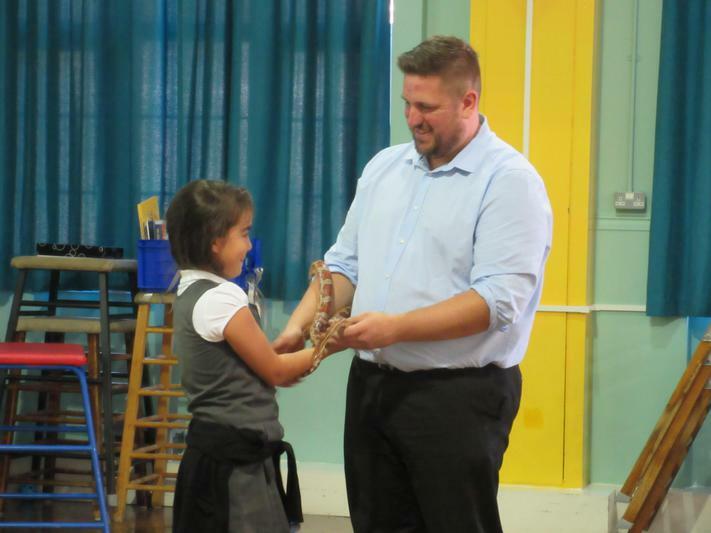 June 2016 - Summer term! Look, look, look! Popcorn is shedding his skin! Popcorn's shed skin measures around 77cm long! 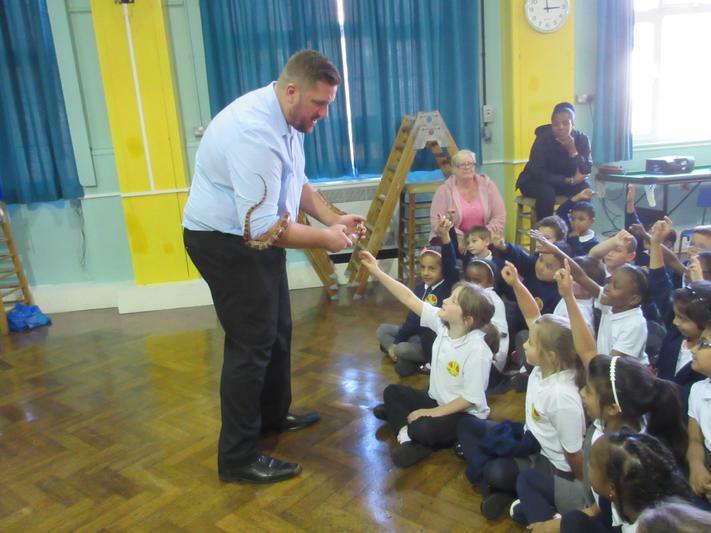 Even Nursery children enjoy meeting the snakes! Mr Remnant showed off Kellogg in assembly at Goldbeaters!